I’m a person who loves convenience when it comes to breakfast during the work week. I typically workout in the mornings, and by the time I come home from the gym to get ready for work, the last thing I want to do is try and start cooking breakfast. 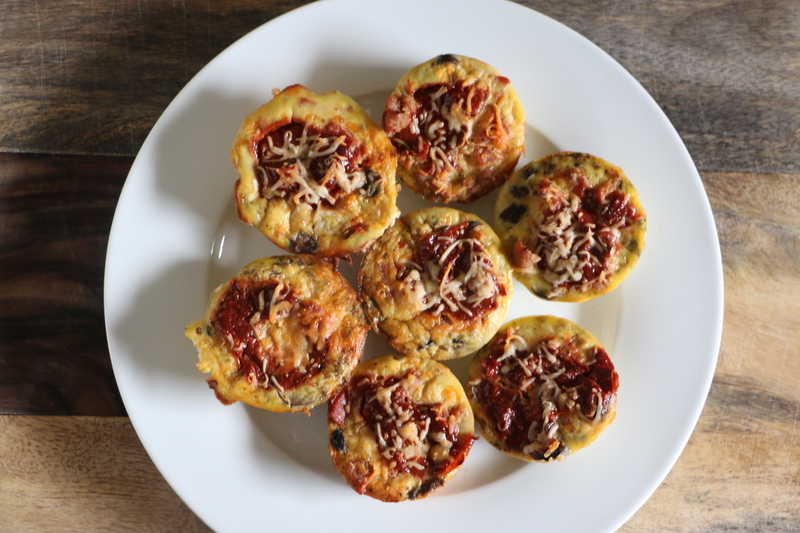 As a result, my go-to-meals for breakfast in the morning are usually egg muffins. They are easy to make, and packed full of flavor. I like to make a large batch of egg muffins on Sundays while I am meal prepping for the week. I portion the egg muffins into ziplock bags and then throw them in the freezer. During the week, it’s a simple task of me throwing a pre-portioned bag of frozen egg muffins into my lunch bag before I head off to work. Although this recipe includes ingredients found as toppings on a supreme pizza, feel free to play around with ingredients and spices. Try making taco egg muffins by using ground beef, cheddar cheese, taco seasoning, onions and peppers. I’ve also made egg muffins with baked chicken, bacon, caramelized onions, mozzarella and artichoke. Those were the bomb! Please share some go to tips you have for making easy breakfasts during the week,and your favorite egg muffin combinations in the comments below! Preheat a large skillet over medium-high heat. Add sausage to the skillet, and cook until the meat has browned and is in crumbles. After the sausage has cooked, drain the excess fat (reserving 1 teaspoon), place the sausage in a large bowl and set aside. Heat 1 teaspoon of fat from sausage over medium-high heat. Added diced red onion and saute for 5 to 6 minutes. Add the diced green bell peppers to the skillet and saute with the onions for an additional 3 to 4 minutes. Remove the skillet from heat, place the peppers and onions in to the bowl with the ground beef, and set aside to cool. In a small separate bowl, mix together the pizza sauce ingredients thoroughly until completely combined. Set aside. In a separate large bowl, whisk together the eggs, coconut milk, Italian seasoning, sea salt, garlic powder and ground black pepper. Once the peppers/onion/sausage mixture has cooled, to the large bowl add chopped pepperoni slices, black olives, portobello mushrooms and 1/2 cup mozzarella cheese and mix together. Line two 12 serving cupcake pans with liners (or grease the muffin cups with cooking fat). Fill each cupcake liner half way with the egg/coconut milk mixture, and then fill each liner with approximately 2 tablespoons of the supreme pizza topping mixture. Dollop a tablespoon of pizza sauce over each cupcake liner. Take the remaining 1/2 cup of shredded mozzarella cheese, and sprinkle a pinch of mozzarella cheese on top of each cupcake liner. Place the cupcake pans in the oven and bake for approximately 30-35 minutes until firm (a knife inserted into the egg muffins should come out clean), rotating the pans half way through (and also making sure to rotate the pans from top to bottom). Remove from oven and let cool slightly before serving. 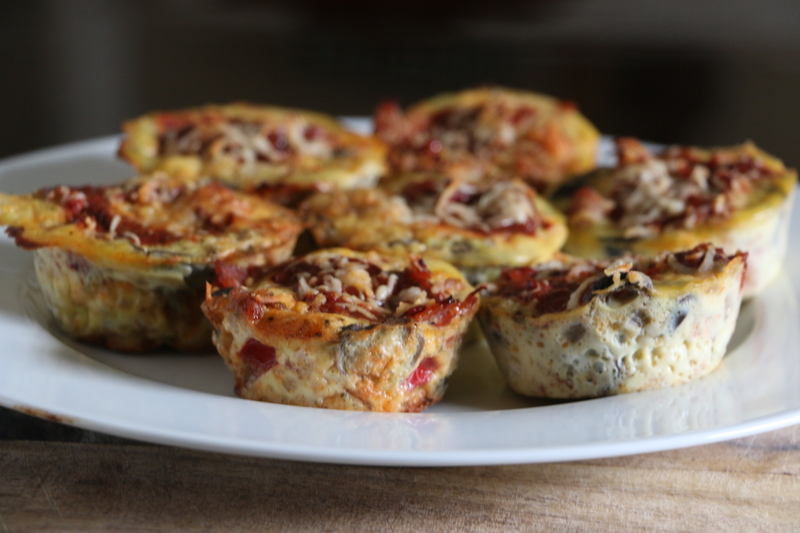 Tags: breakfast, clean eating, convenience, dairy-free, egg muffins, Gluten-Free, grain-free, healthy breakfast, paleo, Primal, quick and easy breakfasts | Permalink. Building Harder to Kill humans through nutrition, fitness & mindset. A real-life approach to the Paleo lifestyle with tips and recipes to get the whole family healthy.